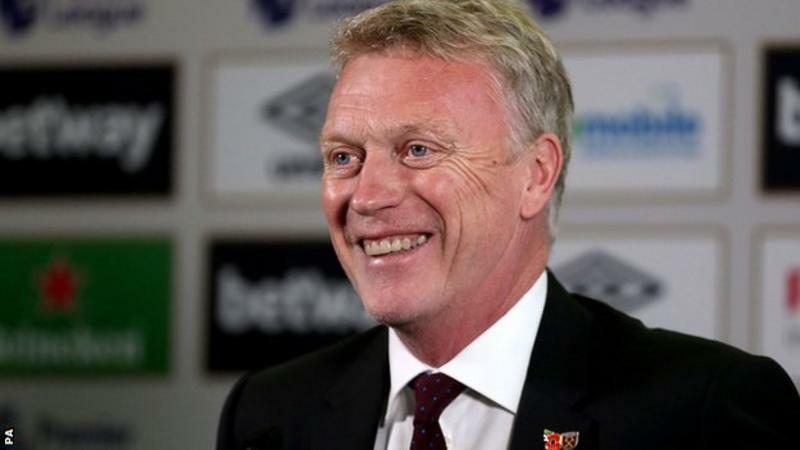 David Moyes has a top-flight win percentage of 38.6West Ham boss David Moyes says he has a "point to prove" as he aims to "repair" his reputation at his new club.The former Everton and Manchester United manager has replaced Slaven Bilic, who was sacked on Monday with the Hammers in the relegation zone.Moyes, 54, has been out of work since May, when he resigned as Sunderland boss after the club's relegation to the Championship. "It is good for West Ham, they are getting a good manager," he said.Moyes, who started his managerial career at Preston North End, was voted LMA Manager of the Year three times while at Everton from 2002 to 2013 - an 11-year spell during which they finished in the top eight nine times. He signed a six-year contract when he succeeded Sir Alex Ferguson as Manchester United boss in 2013 but was sacked 10 months into the deal.Moyes then went to Spain to manage Real Sociedad but was dismissed in November 2015 after a year in charge.He took over at Sunderland in July 2016 but quit in May 2017 after the Blacks Cats finished bottom of the Premier League. "I do have a point to prove. Sometimes you have to repair things and I have a little bit to repair," said Moyes, who has a contract until the end of the season with the east London club. "It's good for me, I'm back in and it's what I love doing. I want to do well and want the team to do well." bbc.comThe Hammers are 18th, having won just two Premier League matches this season.They spent a reported £42m on players in the summer including forward Marko Arnautovic from Stoke City for a club record £20m and former Manchester United striker Javier Hernandez from Bayer Leverkusen for £16m.Having lost their first three games, West Ham have taken just nine points from 11 league matches, conceding 23 goals.Following a trip to Watford on 19 November, West Ham host Leicester City and go to Everton, before a difficult run in December in which they face league leaders Manchester City, champions Chelsea and Arsenal.Later in the month, the Hammers travel to face the Gunners in the Carabao Cup quarter-finals. "My ambition is short term. I have to win the games," said Moyes. "I want the football to be entertaining. But I want to start defensively. We have to start there and get some clean sheets. "First it's about winning football games, then it's about the style. "There's a really strong squad of players here. They certainly shouldn't be in the position they are in." Since moving to London Stadium at the beginning of the 2016-17 season, West Ham have the third-worst home record in the Premier League.They have conceded the second-highest number of goals (41) in the league, with only Swansea (44) having conceded more - but the Hammers have the worse goal difference in the top flight with -16. BBC Sport's Simon StoneThe break David Moyes has had from the game since leaving Sunderland at the end of last season has had a positive effect on the Scot, at least visually. He also spoke confidently.Typically, he did not shy away from questions, although unlike his latter days at Manchester United, when he looked haunted and daunted by the situation he found himself in, he handled them with certainty.The elephant in the room was the 'slap' comment to Match of the Day interviewer Vicki Sparkes. They were brought up by a female journalist, and followed up by another. West Ham vice-chairman Lady Karren Brady, who was critical at the time, was mentioned. Had Moyes spoken to her? Was the comment mentioned? Straight back, Moyes responded immediately. "Yes. No." The insinuation was that Brady's comments were not quite as they had been portrayed but there was no clarification on what they actually were.Moyes, evidently, regards it as history. He said he made a mistake and apologised. In his mind at least, it is time to move on.If the world had turned out differently, Moyes would now be in the fifth year of his six-year contract at Manchester United. But it didn't. At Old Trafford, inside and out, he is regarded with ridicule. Since then he has failed at Real Sociedad and failed at Sunderland. His 11 years at Everton seem such a long time ago.As he looked out at his audience, and the darkening London skyline to his left, Moyes admitted something on which the entire crux of his new - and maybe last - Premier League job will hinge. "I do have a point to prove," he admitted. "Maybe I do have a little bit to repair."